Resistant Starch (RS for short) is being called the biohack of the decade and with good reason. The majority of people experimenting with it are reporting dramatic improvements in well-being across a number of measures. 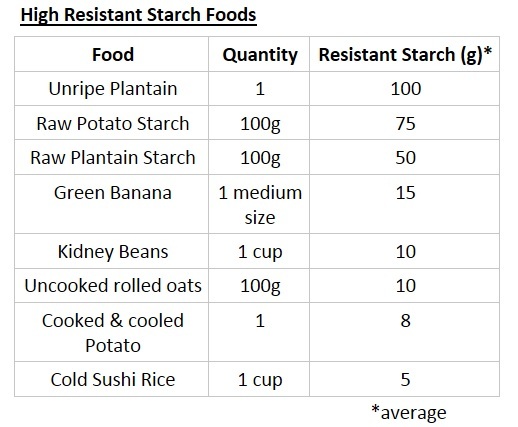 So what is Resistant Starch? Resistant starch is named so because it is a starch that resists digestion. RS is a carbohydrate with a complex molecular structure that the body cannot break down and absorb as glucose. 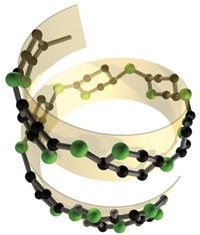 It is a long amylose chain wrapped in a helical like structure. Because of this it bypasses digestion in the small intestine and is used as food for bacteria primarily inhabiting the large intestine/colon. Thus the purpose of taking resistant starch is to symbiotically feed your microbes which then in turn do all kinds of wonderful things for you. RS3 – Resistant starch that is formed when starch-containing foods are cooked and cooled such as in legumes, bread, cornflakes and cooked-and-chilled potatoes, pasta salad or sushi rice. Occurs due to retrogradation, which refers to the collective processes of dissolved starch becoming less soluble after being heated and dissolved in water and then cooled. We are primarily interested in RS2 and also a bit in RS3 as they are the natural accessible forms of RS. Medical science for the last century has largely ignored the human microbiome much to it’s own peril. When it comes to numbers we are in fact more mircobes than human, as microbe cells outnumber human cells 10 to 1 in and on the body. It is estimated that there are more than 1,000 species of gut microbes and more than 7,000 strains that collectively contain 150 times more genes than the human genome. These bacteria through their processes also help modulate the human genome epigenetically altering our very own genetic expression. In fact the very reason resistant starch works so well is that it reverse some of the damage western medicine has done. Ever since the discovery of penicillin and antibiotics western medicine has been on a crusade to kill bacteria, many of which have been wrongly demonized. Our germ-a-phobic society has installed hand sanitizers in almost every conceivable location and many cleaning products are marketed for their germ-killing properties. Antibiotics have found their way into our food and are used extensively on animals. In the words of one man what we have effectively done is conducted “mass extinction” which has a plethora of unintended consequences and inadvertently caused a whole host of chronic illnesses. When people take antibiotics they tend to be broad spectrum and while they kill many “bad” guys they also kill “good” guys. Taking antibiotics is akin to taking a nuclear bomb to your gut. It kills all bacteria without discrimination. However it won’t kill fungi and with the bacterial competition eliminated fungi can grow out of control and cause conditions such as Candida. In addition to this many harmful bacteria are now also becoming resistant to antibiotics so when taking antibiotics it may often kill more good guys than bad guys, allowing the bad guys to gain even more of a foothold. Repeated rounds of antibiotics over life can then create dysbiosis which is at the root of many modern chronic diseases. The goal of using Resistant Starch is to help restore the balance of microbes in the gut. This is done by providing a prebiotic food (RS) that feeds the good guys and crowds out the bad guys. Over at Free The Animal blog, commentator Tim Steele (aka. tatertot) had been experimenting with the potato diet some time ago and became interested in resistant starch. After doing further research through older published journal articles he found a mountain of evidence showing the benefits of using resistant starch. So in line with those previous studies he began experimenting on himself with high dose RS and feeling the benefits convinced other to follow suit. Soon a whole movement had started as person after person tried it out and had enormous success. Diabetics were reducing their insulin and many people were reporting lifelong health ailments being drastically improved or cured. What is profound about these results is the reduced frequency of Proteobacteria. Proteobacteria are considered pathogenic and consist of species such as E. Coli, Salmonella, Vibrio and Helicabacter. Everyone has small amounts of these bacteria in their gut however the quantity and degree of proliferation is an important indicator of health. Tim had the lowest amount of all comparable samples! In addition to this his most enriched microbes were all of the beneficial kind. The highest being Bifidobacteria notable for their health promoting properties. Tim never did a test before taking the RS so we don’t know what his gut profile looked before the RS, however the improvements in health and well being speak for themselves. After many people have taken on the RS challenge they have seen similar improvement in well being as well. All the published studies show that a person needs about 20 grams of resistant starch minimum before meaningful benefits are seen and that at about 50 grams diminishing returns are in full effect providing no additional benefit. Thus ideally you want to get about 20-50 grams of RS per day. It is highly unlikely that you will get there by food alone because most cooking/heating and food processing destroy the RS found in food. So therefore supplementing is almost always done to reach the minimum necessary amount to see beneficial effects. 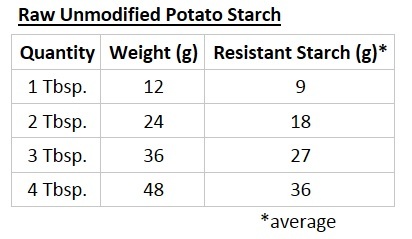 Currently the easiest way to get to the minimum 20 grams necessary of RS a day is to use several Tbsp of raw unmodified potato starch in a glass of water. It is about 75% RS by weight. It is very important you do not get regular potato flour. This will not work as the heating process almost entirely destroys the resistant starch. When starting RS it is best to start slow. The gut will be undergoing some drastic ecological shifts as RS is added. Some people start at sub-tsp doses. Everyone is different in terms of their own microbiome so only you can decide how much to take and how long it takes to reach full dose. You want to eventually reach at least 2 Tbsp a day and most people opt for settling around 4Tbsp a day. Some heroic people take up to 8Tbsp a day. It would appear taking more at once may be better than spreading doses throughout the day. The reason being is that taking RS in a larger bolus dose increases the chances more will make it to the large intestine where it is thought it is needed most. That said a maximum of 4 Tbsp is recommended at one time. The biggest side effect of taking RS is increased gas. This is very normal and almost everyone doing this protocol experiences this. If the the gas becomes too much, stop taking supplemental RS for 1-2 days. This will give the gut a break and a chance to do some of it’s own re-balancing. Most people have found that the additional gas goes away after using RS for at least one month so therefore expect it to take that long for your gut biome to do most of it’s re-balancing. The average western person on a SAD consumes about 3-5 grams of resistant starch per day. Where as the average Asian person consumes about 6-8 grams of RS per day. Most people therefore do not consume enough resistant starch from food alone and thus need to add a supplement. That said if you start making your primary carb sources cold rice, potatoes & properly prepared beans it can help create a good foundation. If you have lived your life and never or perhaps rarely taken antibiotics and you typically eat fermented food on a routine basis, chances are RS may not benefit you as much as someone else. If however you have been exposed to repeated rounds of antibiotics and don’t eat much fermented food, chances are RS can offer you great improvements in terms of health. The people it helps most notably are people who are struggling with Intestinal issues such as IBS, Chron’s, diabetes, metabolism issues and people struggling with immune system related issues. It also offers considerable benefit to those struggling with hormonal and neurotransmitter issues as well as things like anxiety, depression and OCD. It’s ironic that those most compulsively concerned about “germs” are likely people who have suffered from immune system related problems in early childhood causing health ailments where dysbiosis has been at the root, often unbeknownst to them. It has been said the best offense is a great defense. And this couldn’t be anymore true here. It’s not that all “germs” are bad and should be eradicated, the fact is RS works precisely because it feeds and supports “germs” namely the “good” ones rather than the “bad” ones. The old wives tale of living in too clean of an environment leads to immunity issues such as allergies down the road such as in the hygiene hypothesis therefore is only partially true. It’s not lack of exposure that is the issue rather it is that many people carpet bombed their immune system/bacterial support system to the point where it was so compromised it has never fully recovered. 95% of the bodies serotonin is produced in the gut by bacteria. One of the main bacteria implicated in the serotonin production pathway is Bifidobacerium Infantis. If you remember Tim Steele’s most enriched bacteria was the bifidobacterium at an eleven fold increase above normal levels. This means that taking appropriate prebiotics and ensuring that you are also taking the right bacterial strains could lead to dramatic shifts in neurotransmitter and hormone production capability. There has been a lot of research lately showing how various bacteria can reduce anxiety and depression and alter mood and behavior. One of the root causes of depression and anxiety is a gut imbalance which then leads to a neurotransmitter imbalance. What else is interesting is the reverse is also true. Negative thoughts, feelings and stress also influence bacteria and can raise levels of “bad” bacteria and lower levels of beneficial bacteria through stress hormonal activation. It seems resistant starch may have powerful effects on serotonin and therefore melatonin as well. I have personally found that that taking RS 4-5 hours before bedtime to be important. If I take it right before bed I wake up feeling exhausted. I believe the reason is that transit time from mouth to colon is roughly about 4-5 hours and it is ideal to have the RS arriving in your colon as you sleep. It seems to promote more rejuvenating sleep and perhaps assist with critical liver detox that occurs in the early morning hours. A brief map showing species variation depending on location as well as average number of organisms. 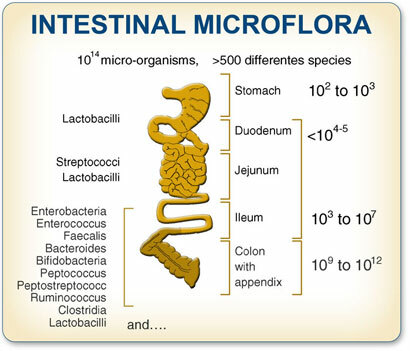 The lactobacilli tend to occupy the upper intestines while the bifido dominate the lower intestine. Both the above tests are genetics based in that they are sequencing the DNA of the micrboes in your stool. This is quite different than then standard practice of using a microscope and eyeball-estimating or culturing. In many cases supplemental bifido can also completely eliminate IBS and diarrhea. But perhaps one of it’s most beneficial aspect is that bifido cross-feed other beneficial bacteria species. Specifically Clostrida being one which then produce SCFAs. SCFA are an energy source for your intestinal cells. They also help tighten the junctures in the intestinal cell lining preventing conditions such as leaky gut. The online community that is currently experimenting with RS is trying different bacteria and combinations of bacteria to see what works best. There is likely to be a lot of individual variance. So far the following stand out. While there are many bacteria that have benefits for one reason or another these ones specifically are singled out for their remarkable properties in conjunction with RS. B.Infantis which is likely the primary bacteria responsible for Serotonin production is not found in 90% of probiotics on the market. 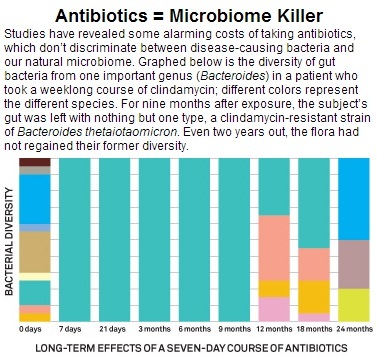 This is why doing your research is important before buying probiotics. Bifidobacterium infantis – implicated in the serotonin production pathway, has anti-depressant like effects and improves motivation. Also rated the top bacteria in a comparison study with 9 others from VSL#3 in terms of reducing gut permeability. Lactobacillus brevis and Bifidobacterium dentium – best GABA producers (reference) B.Brevis is rated 2nd in terms of reducing gut permeability in a 9-species comparison. Lactobacillus Plantarum – strong imuno-modulation tendencies; may also cure eczema (reference) Rated 3rd in reducing gut permeability compared to 9 other species. 1st in reducing soy allergy in this study. B. subtilis – makes Vitamin K2 and digests gluten, casein & sourdough. Also 2nd in reducing soy allergy. 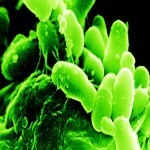 Jenny McCarthy attributes curing her son of autism partly through the use of Threelac which contains this bacteria. Anecdotally other people have cured their allergies and eczema as well. But won’t RS feed the bad guys too? According to the evidence collected so far it will not. In fact the opposite seems to be the case, in that it feeds primarily the beneficial bacteria and crowds out/inhibits the more dangerous Proteobacteria such as E.coli, Salmonella, Vibrio and Helicobactera. 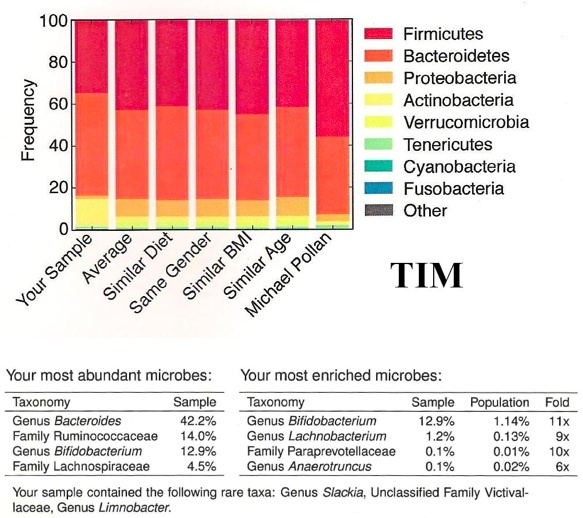 If you look above at Tim Steels n=1 report you will see he has less pathogenic Proteobacteria than anyone else! This has seemingly been one of the most profound discoveries when it comes to RS. In fact resistant starch has been used as an effective treatment to treat cholera. It has been shown in a lab that 98% of cholera bacteria will detach from an agar substrate and bind to the resistant starch for elimination. (refrence) Dr. B G uses resistant starch as part of her Small Intestinal Bacteria Over-growth (SIBO) protocol to flush out excess microbes from the small intestine. The increase in beneficial bifido populations which is on of the primary functions of RS helps create a more acidic environment through enhanced SCFA production in the colon which is considered a good thing. This environment inhibits the virulent hyphal from of the fungus Candida reverting it to its non-pathogenic unicellular form. (references) Anecdotally for me personally RS was the key that helped me get over a pervasive candida infection. All prebiotics are in the form of molecules called glycans. There are over 2,000,000,000 glycans the constitute the “human glycome”. Cutting edge research is exploring these glycans and how they relate to various microbiota. Your body produces mucin (as in mucous a type of glycan) in the gut and this is also there for the purposes to help nourish your microbiome. So how do all these other prebiotics/glycans compare to resistant starch? Not all glycans are equal. No one really knows and studies are mixed in terms of results. In vitro vs in vivo can make a difference and cross-feeding among bacteria and individual biome uniqueness can create hundreds of confounding variables further complicating the matter. Ultimately a mix of the various prebiotics is probably best to cover most of your basis. However using RS as a foundation is probably wise because anecdotally we know it works for many people. GOS is another well known prebiotic that has been empirically shown to have good bifidogenic properties. GOS is a substrate similar to those secreted in breast milk that fuels the 90% bifido as a ratio of gut population in infants. Prebiotics is something that needs to be researched further and experimented with. It could be a serious contender to RS, but for the time being RS is much more accessible found in most local grocery stores. Plus it’s cheap. Diversity is a good thing especially when it comes to prebiotics and probiotics. What I do personally is mix a bunch of things together into a super booster style drink and rotate various probiotics. I drink this once a day on an empty stomach 4-5 hours before bedtime. Mixing the probitoics with RS in water is ideal because it will enhance survivability and should increase transit length through the GI tract as well. Larry Smarr: Can we quantify our own illness?